I know that some of you wanted to egg and toilet paper my house the day I painted over our green living room, but it was such an eye opening, space expanding difference when our kitchen and living room had cohesive paint colors. However, I do miss that green paint. And I am still hoping to bring it back into our home in some shape or form down the road. 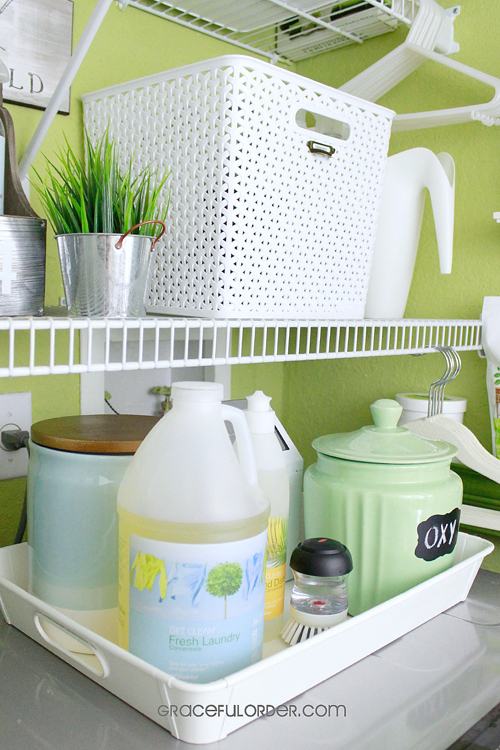 Until then, I am going to drool over Maria's green laundry room closet instead. 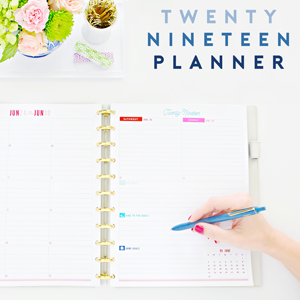 I focus on a lot of things around here, but it is safe to say that organization and color are two primary elements of this blog. 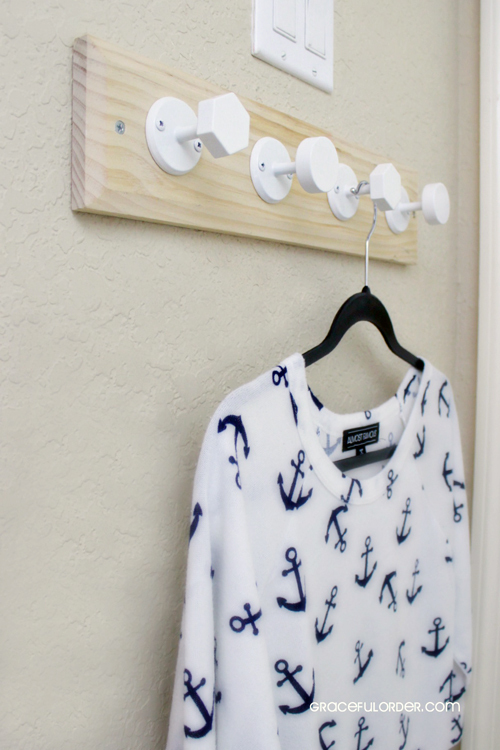 The perfect pairing to Maria's laundry closet, which touches on color, organization and so much more. In fact, I initially thought I was looking at an entire laundry room, when in fact, it is a standard closet behind bifold doors. That tells the story of the power of paint, great lighting and smart storage solutions. 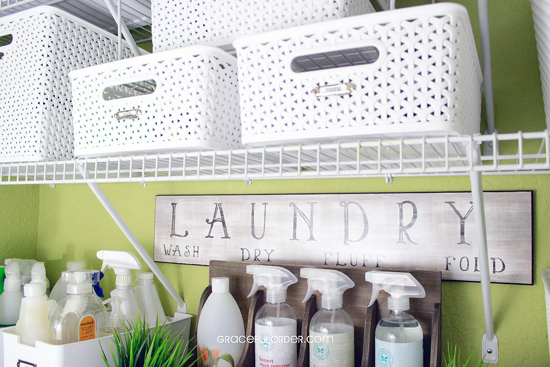 Maria is visiting us today from her personal blog, Graceful Order, to share more details about why she hearts her laundry room how she made it function big. "This is my laundry closet and also where I keep all my cleaning supplies." 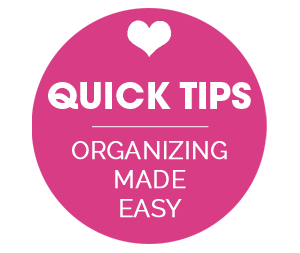 "It is difficult to keep a space organized that has a ton of different products. 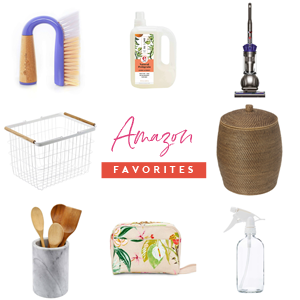 I chose to separate the cleaners by purpose and sometimes by brand in order to access them easier and also making it easier to put away." "The white plastic bins were essential in organizing this space. I have wire rack shelves in this space which were economical. However, products topple over and spill if I place them right on the shelf. 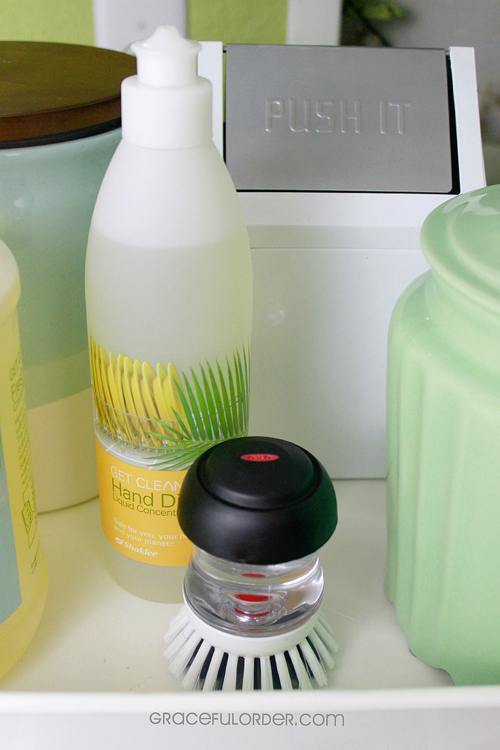 The bins keep the products from falling over and if they do, since they are plastic, I can easily clean them. I also added shelves to the side walls and used the vertical space as much as possible. 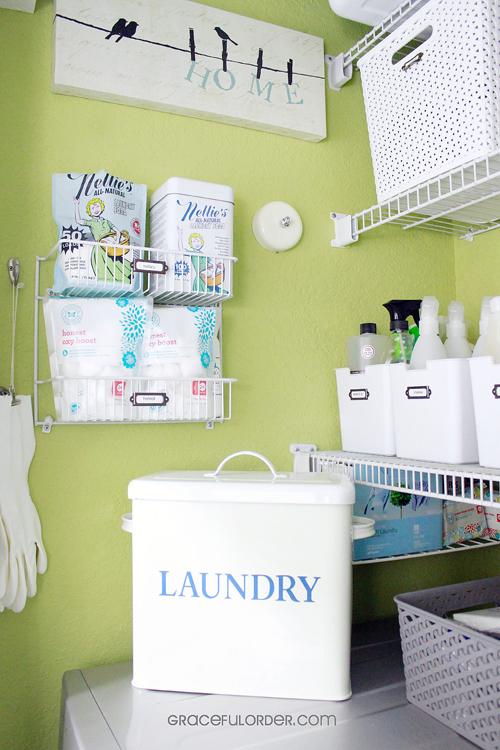 Adding a drying bar to the opposite wall, made the laundry space complete and it felt like more of a room than a closet. A simple item that made a big difference, was a tiny trash can so that I can empty dryer lint and little wrappers from the boys pockets. 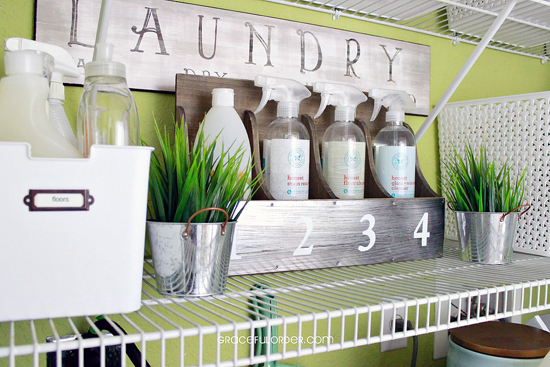 Little tin buckets from the dollar section hold loose change (one of the few perks of doing laundry) and clothespins." "All the baskets and shelves that I purchased were not the same brand but they are all white and they make the space look cohesive and bright. I also added little faux plants to add color and 'life' to the little closet." 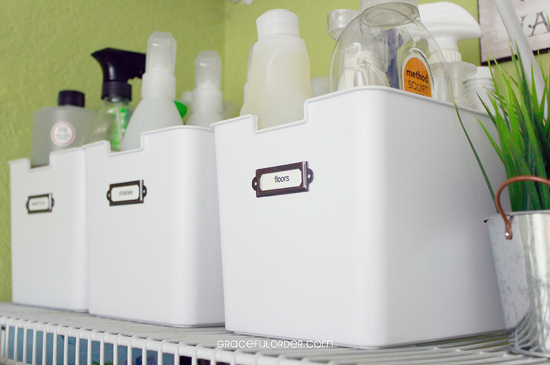 "I purchased all the plastic bins at Target while they were on sale. When I have to purchase more than a bin or two, I look out for the sales to stock up on what I need. I did add some stick-on labels to the plastic bins which were both functional and pretty! I love displaying cute products on a metal tray which is a pretty affordable way to decorate." "I wish I could say that I now skip to the laundry closet but... Well, I don't. I can say that doing laundry is a lot more bearable in a bright closet where every item is in its place. It's amazing how much you can do with a small closet once you decide to maximize the space you have. You can make anything beautiful, even the laundry area." 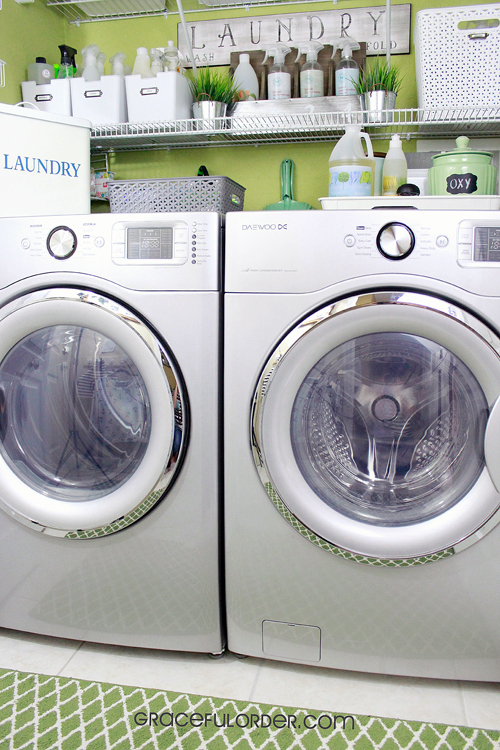 Maria's laundry room is a breath of fresh spring air. Another space done right with cohesive baskets, labels, maximized vertical space, beautiful use of color, functional products that double as everyday decor and even a sweet little lint bucket. Oh! And a laundry line for air drying. Love that! It is important to love the space where work and household chores are done, and I think Maria did a wonderful job at creating a joyful place to enjoy on laundry day. 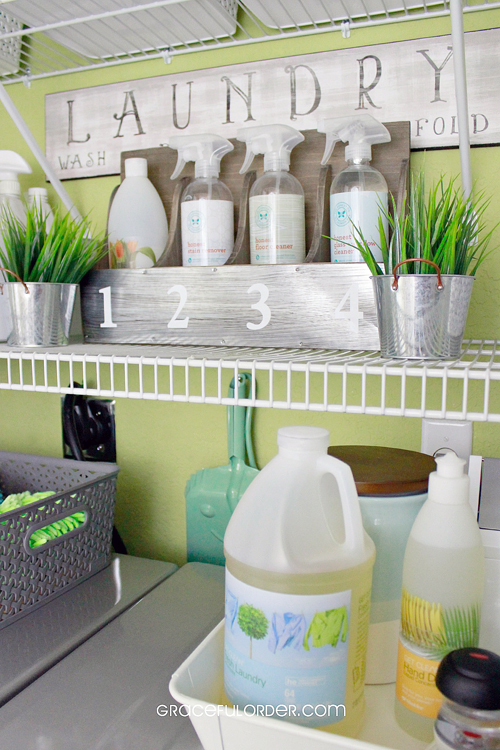 You can find all of Maria's helpful laundry room organization tips on her blog here. Gorgeous! Love the idea of using lots of different baskets/containers in one cohesive color. That is beautiful!! And so springy!! That tiny trash can! How have I NEVER thought of that before?! The dust pan makes it for me! Isn't it the cutest?! I found it at World Market. I am officially having Laundry Envy right now. What an amazing colour for a laundry. Beautiful! 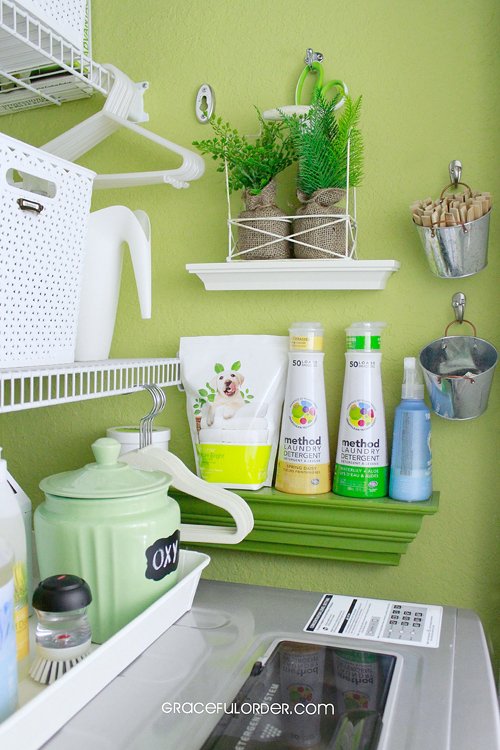 I especially love the little green shelf. Something about that small detail adds so much character. Oh I love that shade of green paint! That is so pretty and has the right amount of yellow in it. And I love the container she uses for the oxyclean! Thank you, Lisa! The color is Lemongrass from Sherwin Williams and the oxy container is a cookie jar from World Market. I am just in the process of redoing our laundry space, and adding some finishing touches...pretty sure some of those are going to have to include these. Absolutely gorgeous! Can't believe a CLOSET holds that much organization and prettiness! I'd love to read her blog, but it appears to be down or something. 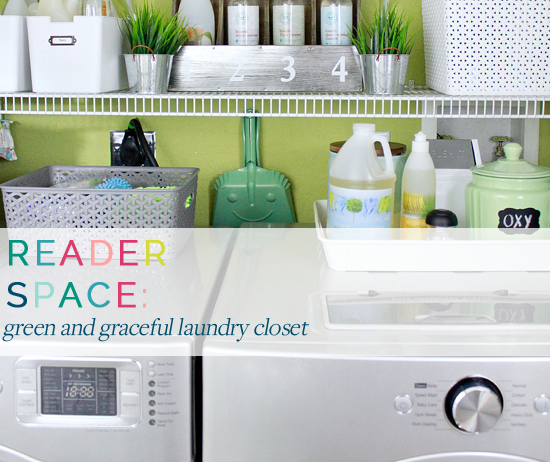 Hopefully its up and working soon, I'd love to read more from the woman behind this beautiful laundry space! I love this! And Shaklee is AMAZING! Love the tray on the dryer - I have never thought of that! 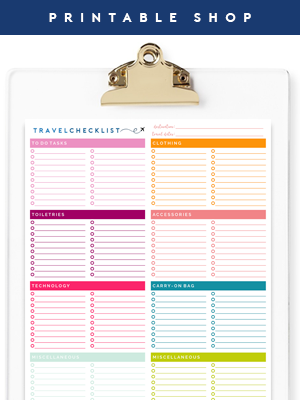 Great idea to keep things orderly and from falling off the side. I have a similar space with these shelves and will use these ideas. Thanks! So much inspiration in one post. 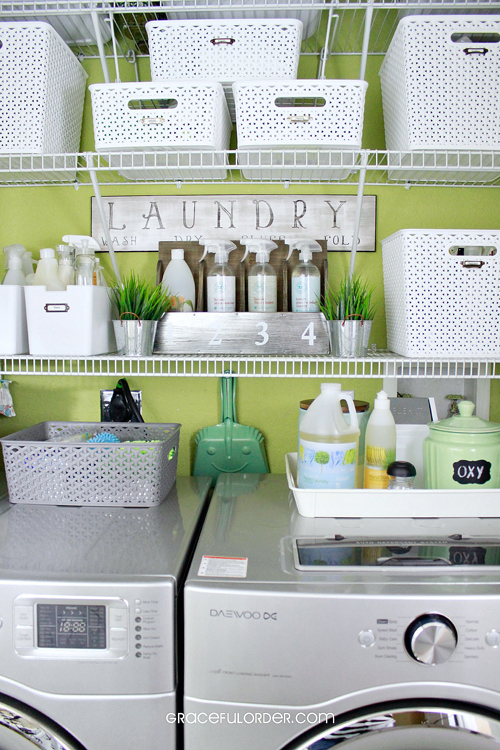 I've been needing to do something with my laundry room...it's a hot mess! As I stood in my old, dated laundry room earlier today, I thought, "This spot is ripe for a remodel and it would it be so peaceful if the walls were green." I imagined some botanical prints on the wall. This post is just the inspiration I needed to get going on it!! Perfect timing! 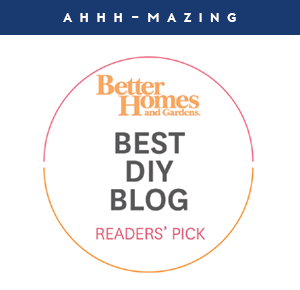 Remodeling and decorating are not my forte at all but reading my favorite bloggers has helped me believe I can do this! SO much inspiration right here!!! Do you mind me asking where you found your bookplates on the baskets/bins? Thanks so much! !